SOAPware DocumentationSOAPware FAQ'sFAQ's SOAPware Cloud SolutionQ: On the SOAPware Cloud Solution, how do I control the size of my screen? A: A user is able to control the size of their screen on the SOAPware Cloud Solution by accessing the display tab, where resolution settings can be chosen. 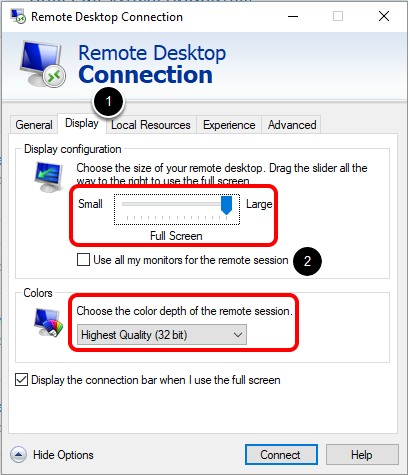 Set the absolute size or choose Full Screen, and the Colors depth. The fewer the colors, the faster your connection will respond. The greater the number of colors, the more attractive your screen will appear. Below are some guidelines for using SOAPware at reasonable combinations. We will start with 19" monitors, running a minimum of 1024x768, as this would be a minimum size for the SOAPware application. These figures are approximations, but give you a very good idea of where to start. 30": At this point, you will need to make sure that your video card can support these resolutions, but Dell has a 30" monitor that will support 2560 x 1600 (digital only). Previous Lesson: Q: Why does my newly created chart section not show up in Chart Navigator? 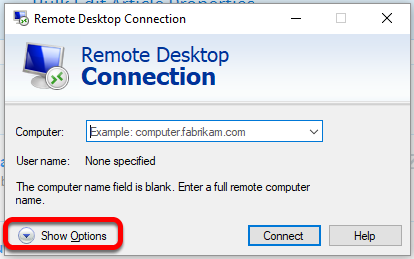 Next Lesson: Q: How do I log out/disconnect from my SOAPware ASP Server?